Thank you for making our special day so much more meaningful and accompanying us on our journey to a new life together. Copy & Paste your message or type "will email later" in the text box if you wish to email message at a later time. You can email your message to [email protected] and reference your order #. We will roll the paper with a string so you can easily pull out the message. Please note: Potpourri/Shells will be packaged separately from ornaments. Easy to follow assembly instructions will be included. 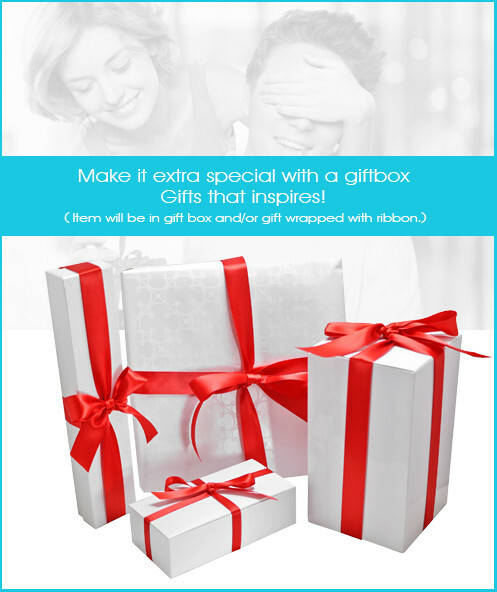 Gift boxes will come folded flat. With two fantastic scents and many more options our Seashell Potpourri Ornaments are perfect for weddings, showers, or just as fun beach party favors. Clear glass ball ornaments come in an easy to assemble package with the scented potpourri and seashells. Confetti is optional of your choice. 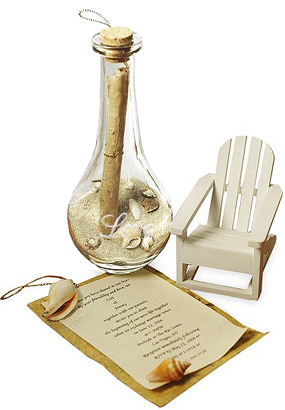 Choose from the lovely golden "tie the knot" scent, or our luscious "blue tide pools" to make a special treat for your guests. Add either our special shower or wedding confetti for an elegant and extra special shine! 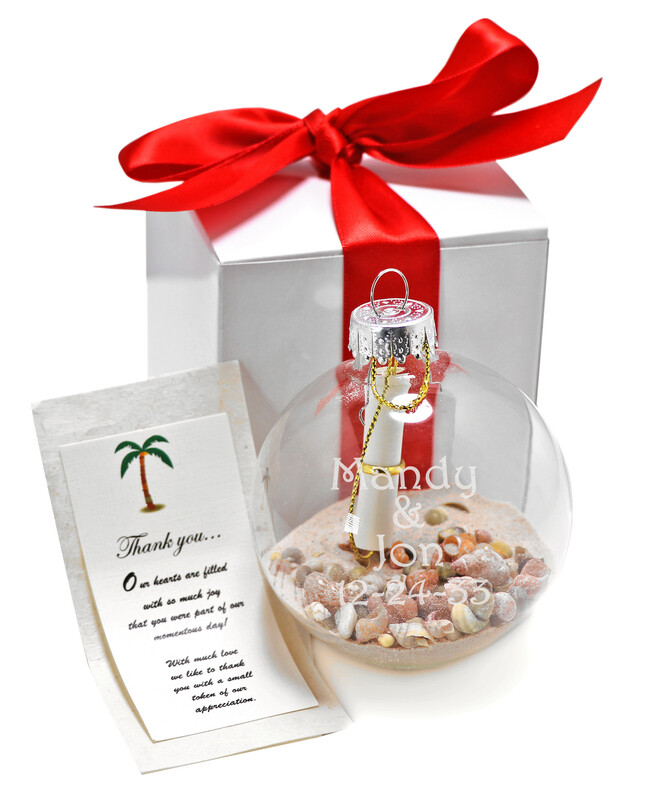 Our fabulous Seashell Potpourri Ornaments come with the colored cap of your choice and free personal engraving, to immortalize your big day. Thinking of purchasing twelve or more of the wonderful favors? 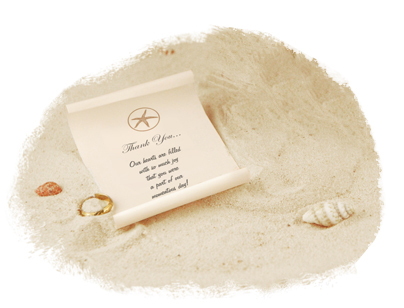 Think about adding on one of our ever lovely Thank You message scrolls with the image of your choice! 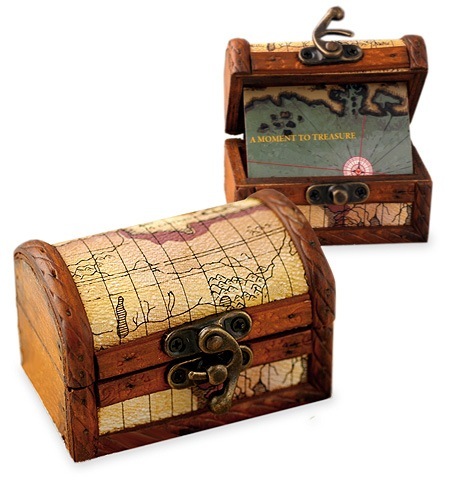 Add a special gift box to your order to keep each ornament nice and safe until it makes it to your guests homes! Make an environmentally friendly splash and set the tone of fun and adventure.